The National Institutes of Health defines epilepsy as a brain disorder in which a person has repeated seizures (convulsions) over time. Seizures are episodes of disturbed brain activity that cause changes in attention or behavior. Epilepsy may be due to a medical condition or injury that affects the brain, or the cause may be unknown (idiopathic). Treatment for epilepsy may involve surgery or medication. While epilepsy surgery is a safe and effective intervention for seizure control, medical therapy remains the more prominent treatment option for those with epilepsy. However, a new 26-year study reveals that following epilepsy surgery, nearly half of participants were free of disabling seizures and 80% reported better quality of life than before surgery. Findings from this study—the largest long-term study to date—are now available in Epilepsia, a journal published by Wiley-Blackwell on behalf of the International League Against Epilepsy (ILAE). More than 50 million individuals worldwide suffer from seizures caused by epilepsy according to a 2001 report by the World Health Organization (WHO). Medical evidence shows that compared with the general population, epilepsy patients have significantly poorer health-related quality of life, higher rates of co-morbidites, and lower rates of employment, marriage, and education levels. Previous studies found that while a majority of those with epilepsy do respond to antiepileptic drugs, over 30% patients are refractory to medical therapy. People with epilepsy start to experience seizures between ages 5 and 20, but they can happen at any age. There may be a family history of seizures or epilepsy. "In cases where medical therapy fails to control seizures, epilepsy surgery is a safe and effective treatment option," explains lead author Dr. Matthew Smyth with Washington University School of Medicine in St. Louis, Missouri. "Despite the increase in the number of epilepsy surgeries performed, and reports in the medical literature of the success of surgery relative to medication, it remains an underutilized therapy for seizure control." A 2001 study estimated that less than 0.1% of the more than 4 million people worldwide who could benefit from epilepsy surgery actually receive the intervention. 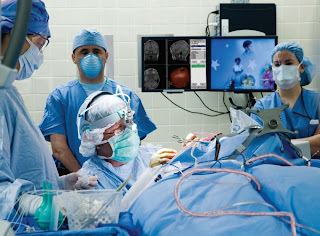 To advance understanding of long-term seizure control rates, researchers analyzed data of seizure and quality of life outcomes for 361 patients who underwent epilepsy surgery between 1967 and 1990; Dr. Sidney Goldring, a prominent neurosurgeon and pioneer of epilepsy surgery, performed the procedures. Patients were then surveyed to assess seizure control and quality of life. Of the 361 patients, 117 completed follow-up interviews for the study and 48% were determined to be free of disabling seizures. On a survey assessing the quality of life for those with epilepsy, 80% of patients reported their overall quality life was better than before the surgery. As the authors expected, surgical complications and mortality following surgery declined over the long-term. No statistically significant association between postoperative complications and long-term seizure control or quality of life outcomes was observed. "Our findings demonstrate that the benefits of epilepsy surgery are sustained over long time periods," concludes Dr. Smyth. "Increased use of surgical intervention offers patients with epilepsy the possibility of long-term seizure control and improved quality of life."